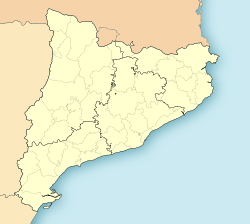 Alforja is a municipality in the comarca of Baix Camp, in the province of Tarragona, Catalonia, Spain. The main monuments are Sant Miquel church in the town, as well as the shrines of Sant Antoni de Pàdua and Mare de Déu de Puigcerver outside its perimeter. ^ a b "Ajuntament d'Alforja". Generalitat of Catalonia. Retrieved 2015-11-13. ^ "El municipi en xifres: Alforja". Statistical Institute of Catalonia. Retrieved 2015-11-23. Wikimedia Commons has media related to Alforja. This page was last edited on 11 March 2017, at 11:09 (UTC).